Moving food through your digestive system is not a simple process: Food does not just drop down into your stomach when you swallow. It’s actually a controlled journey coordinated by muscle cells that line the digestive tract. These cells are organized in two directions: crosswise, circling around the tract, and lengthwise, along the length of the tract. The cells that circle the tract squeeze together behind the lump of swallowed food and relax in front of it. The muscle cells that run lengthwise do the opposite: They relax behind the food and squeeze together in front. Together, the actions narrow the tract behind the food and widen the section in front, pushing the food forward. This motion—called peristaltic movement—happens throughout the entire digestive tract, from the esophagus to the small and large intestines. It’s easy to visualize how the tract narrows and widens with the help of the crosswise cells, but the action of the lengthwise cells can be trickier to imagine. A fun way to visualize this is by placing a marble inside a Chinese finger trap. Pulling the ends away from each other, like in the top image, narrows the tube and keeps the marble in place. 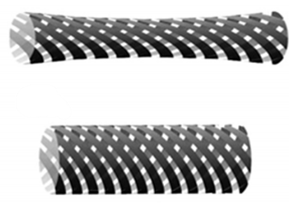 Pushing the ends of the finger trap toward each other, like in the bottom image, widens the tube and allows the marble to pass through easily. When the muscle cells relax, it’s like pulling the ends of the finger trap, and when the cells squeeze together, it’s like pushing the ends. Learn more about this visual experiment in Advances in Physiological Education. Try it at home today.